Custom Mylar Balloons is one of the signature products at Promotion Choice. This article aims to tell you what our foil balloon's advantages are over our competitors' and how getting these custom foil balloons from us will not only save you money with your initial purchase of the mylar balloons, but will also save you lots of money down the road as you fill up each personalized mylar balloon for your event or party. Make your party fun with different colors, styles, and size of foil balloons! Here at Promotion Choice, we allow you to mix and match different shapes and colors, so it could add interest and variety to your party! As long as you use the same ink color for all the styles and balloon colors, there is no extra charge for this mixing and matching. In the 18” size, we have the star shape, heart shape, and circle or round shape balloons. In the 22” size, we have only the square shape balloons. You can only mix and match balloons of the same size. The imprint area for the round mylar balloons is 11” in diameter, while that of the heart and star is 10” in diameter. If you decide to mix and match round balloons with heart and stars, the imprint area used will be the smaller one. The imprint area for the 22 inch square foil balloons is 16.5” width X 14.5” height. So make your party come to live – get gold stars and silver stars, and mix them with pink and purple hearts, as well as green, and blue, and yellow round balloons, and give your party the liveliness and cheerfulness it deserves! If you look at our custom mylar balloons page, you will see that we have a humongous array of colors for each shape as well - six different colors for the star balloons, eight colors for the heart blimps, a shocking 15 colors for the circle or round mylars and the square ones! You will not run out of choices. Our custom mylar balloons are Anagram brand balloons, who has a good and long reputation for making quality helium foil balloons. They are all made and printed in the United States of America. Each custom mylar balloon comes with a self sealing valve, so you need not worry about sealing them manually. Just fill each foil balloon up and voila! You are done! Tie a pretty ribbon around its valve and see it float and “brandish” your logo or message. 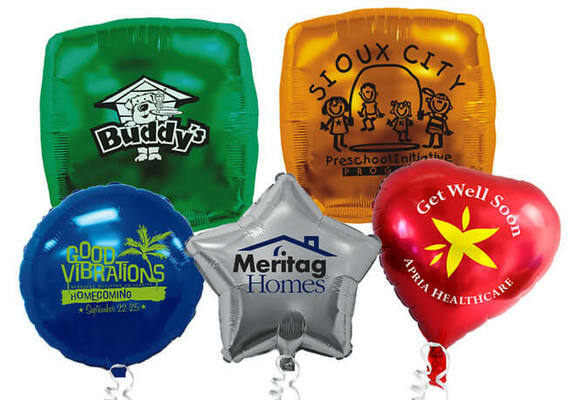 It will be virtually impossible for anyone to miss seeing your imprinted logo mylar balloons. What the above means is that per 242 C.F. Helium Tank, you can fill up to approximately 629 of our balloons versus only about 484 balloons with competitor balloons. This means if you are renting the tank at $150.00 per tank, you are saving an estimate $0.07 per balloons in helium costs! It all adds up, on top of our already super low cost of printing and shipping the custom mylar balloons to you, the extra savings in filling up these balloons ultimately puts even more money in your pocket. And all while the personalized foil balloons work simultaneously to promote your brand and bring you boat loads of customers and orders. Come shop for your printed mylar balloons with Promotion Choice today, and experience our advantage for yourself!